"There is an historic opportunity here." I have a couple of regrets in helping design The Undiscovered Country virtual expansion over eight years ago. We didn't include a Federation Enterprise-A, nor an Excelsior that could report to TOS Earth natively. When I was asked to be on the 50th Anniversary 2E team, I felt like the time was appropriate to correct at least one of those injustices. The initial design plan allowed for one card from each of the classic films and one for each series, along with three wild cards. Eight years later, I now present to you our creation from Star Trek VI: The Undiscovered Country. The implication in Spock's analogy to Kirk regarding their final adventure together was that Kirk's troubled history with the Klingons was advantageous in both showing the Federation's resolve, and in demonstrating Starfleet's willingness to set aside the past in the interests of peace. As a result, the Enterprise-A's abilities both involve Klingon missions and reward you for making an extra effort to reach out to an old enemy. By including all Klingon missions in your TOS deck, you'll be able to drop the Enterprise-A's cost to a measly 3. 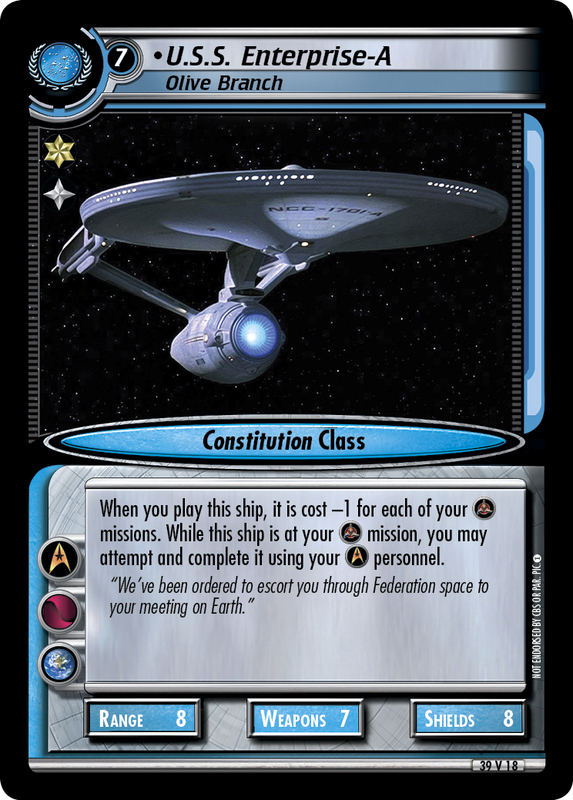 Many TOS decks already include Fed/Kli missions such as Cardassia IV, Secure Strategic Base, and Navigate Argolis Cluster. Beyond that, there exist other more extravagant options, such as Sha Ka Ree and Wormhole Negotiations. But the Olive Branch's second ability broadens the possibilities even further. "People can be very frightened of change." As we attempted to describe the Enterprise-A's directive from the Undiscovered Country in 2E terms, Design went through several various abilities that encouraged players to use a more diverse mission palette. We eventually drew upon another legend in the form of the original Jonathan Archer, whose ability seemed a bit more stable on a ship. Without having to worry about whether or not a certain personnel survives a mission attempt, the Olive Branch gives TOS some intriguing new mission options for old Klingon standbys, such as Commandeer Prototype and, appropriately, Khitomer Investigation.